Don S. Liuzzi was born and raised in Weymouth, Massachusetts, and completed high school at the Franklin Learning Center in Philadelphia. He earned his Bachelor of Music degree from the University of Michigan and his Master of Music degree from Temple University. His primary teachers were Alan Abel, Charles Owen, and John Soroka. Before joining The Philadelphia Orchestra in 1989, Mr. Liuzzi was a member of the Pittsburgh Symphony percussion section from 1982 to 1989. While in Pittsburgh he was on faculty at Duquesne University, was assistant conductor of the Three Rivers Young Peoples Orchestra, and percussion soloist on PBS’ nationally syndicated “Mr. Rogers’ Neighborhood”. Beyond the over 80 commercial orchestral recordings, Mr. Liuzzi has been a recording percussionist with the Network for New Music on the CRI, Crystal, and Albany labels. His percussion solo and chamber CD release from 2012, Movement in Time (Equilibrium), is Volume I of the Philadelphia Percussion Project which features music by Maurice Wright and Maurice Rissman. Volume II was released in May of 2015, a percussion ensemble recording featuring Jennifer Higdon’s Zones, featuring members of The Philadelphia Orchestra’s percussion section. A participating musician in the documentary film Music from the Inside Out (2005), Mr. Liuzzi also served as the film’s coordinating producer. The documentary film by Anker Productions, featuring The Philadelphia Orchestra, was re-released digitally on iTunes in June 2013. Mr. Liuzzi’s other electronic media activity (under his company name of Beat the Drum Entertainment, Inc.) has produced and performed on CDs and videos as drummer and singer on Weapons of Grass Construction with the DePue Brothers Band. Their most recent album, When It’s Christmas Time, was released in December 2013. Mr. Liuzzi has given master classes on four continents. 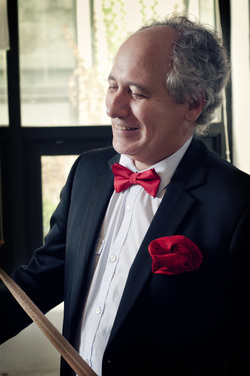 He has taught and performed at the National Orchestral Institute, the New World Symphony, the Pacific Music Festival, the Festival of Percussion Patagonia, the Canton International Summer Music Academy, the Lindenbaum Music Festival, the Youth Orchestra of the Americas, and the National Youth Orchestra USA Carnegie Hall. He joined the faculty of the Curtis Institute of Music in January 1994. He has also held faculty positions at Rowan University and the Manhattan School of Music. Mr. Liuzzi completed his tenth and final season the music director of the Philadelphia All City High School Orchestra, was the founding conductor of Curtis Institute’s 20-21 New Music Ensemble, and is now the Music Director of The Mainline Symphony. From 2009-2015, Mr. Liuzzi has regularly performed with the Saito Kinen Festival Orchestra under Seiji Ozawa in Matsumoto Japan. Mr. Liuzzi’s early orchestral experience included the Flint Symphony, the Michigan Opera Theater Orchestra, and the Colorado Philharmonic. He has also participated in the Spoleto Festival Orchestra and the Tanglewood Music Center Fellowship Orchestra. In July 1996 and 1998 he made his solo timpani debuts with The Philadelphia Orchestra. In April of 2016 he will perform the world premiere of Resounding Drums by Maurice Wright with The Philadelphia Orchestra, under the baton of Music Director Yannick Nezet-Saguin. He is now a Yamaha performing artist and product consultant, with a highly regarded YouTube solo appearance and interview through his Yamaha affiliation. He is married with two adult daughters.